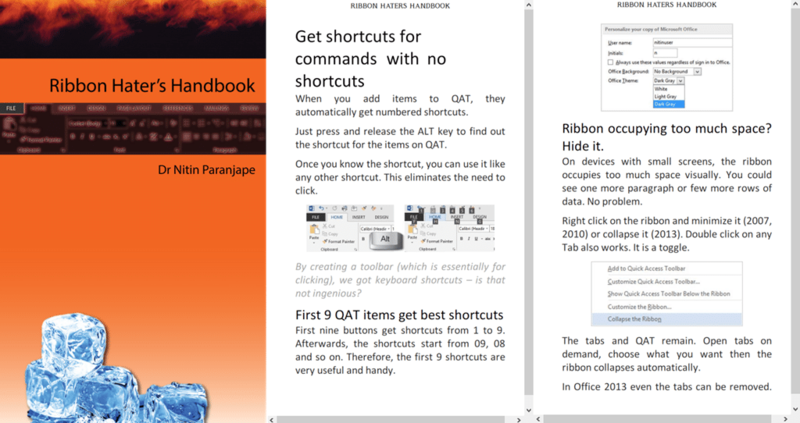 This article is relevant if you capture screenshots of Office ribbon for content creation. This book explains how the Ribbon is an empowerment rather than a disappointment. Office Ribbon was introduced around for 7 years. Still most of us are still not comfortable with it. Some of us hate it actively, most of us just settle for a compromise. View details on Amazon Kindle bookstore. Only available on Kindle platform. If you don’t have a Kindle device you can still read it by downloading free Kindle Reader Apps for Windows PC/ Mac, Android, Windows Phone, BlackBerry, iPhone or iPad devices. Ribbon is good for you. The File menu now occupies the full screen for a purpose. Explore all options there and you will be surprised how much you were missing out on. Sometimes, you need to create a custom ribbon for a specific document. Such documents, if commonly reused, should be stored as templates. Download interactive command guides. These help you find old commands in the new UI. Try using it on Format Painter and Highlighter. Double clicking allows you to use the button repeatedly – it remains in the same ‘Mode’. For example, if you want to copy formatting from one shape and apply it to multiple shapes (even across slides) – this is how you do it. Select the original shape from where you want to copy the formatting. Double click on Format Painter. Now the mouse cursor changes. Now click on one or more shapes. You can change to another slide, still it is in Format Painter mode. When you finish, press Escape. This is unfortunate because we do need to draw multiple shapes of the same type quite often. But don’t worry. 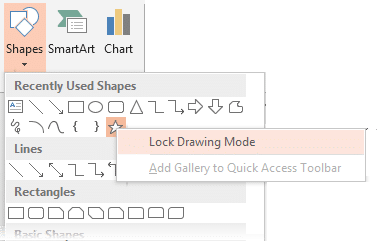 Right click on the shape and choose Lock Drawing Mode. Now you can draw multiple shapes of the same type without clicking on the shape icon repeatedly. I will cover what I learnt while creating and publishing the Kindle Book.